The Vancouver detached market finished 2017 on a cold streak. With the slow pace of sales, rising inventory levels, and the introduction of new mortgage rules, the detached market has the attention of many market watchers. January 2018 seems to be a continuation of recent trends, with weaker than normal sales and further downwards pressure on prices. When comparing on a year over year basis, January sales inched up by 3.4%, however they remain a staggering 47% below the ten year average for the month of January. The 91 sales recorded for the month of January were the second fewest since 2009. 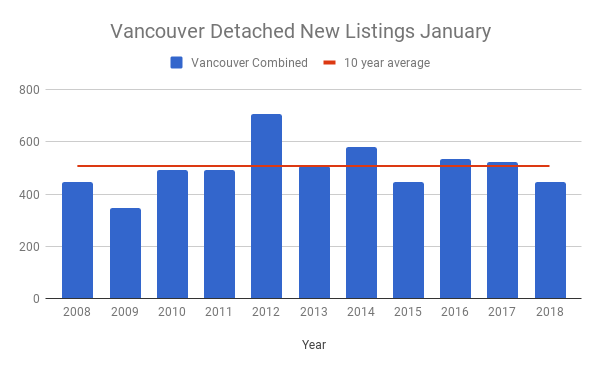 To some surprise, new listings fell in Vancouver for the month of January, dropping 15% on a year over year basis. For sellers holding out and hoping the market will rebound this will be an important stat to follow. If new listings remain low it could be the catalyst to push inventory levels lower and relieve some of the downwards pressure on prices. January New Listings for Vancouver Detached homes. Despite the decline in new listings inventory still inched up on a year over year basis by 2%. 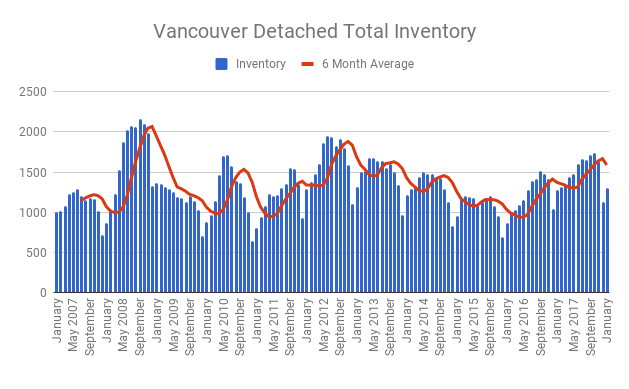 Detached inventory has been on a steady rise for nearly two years helping to the easing of prices, largely in part due to the substantial decline in sales. 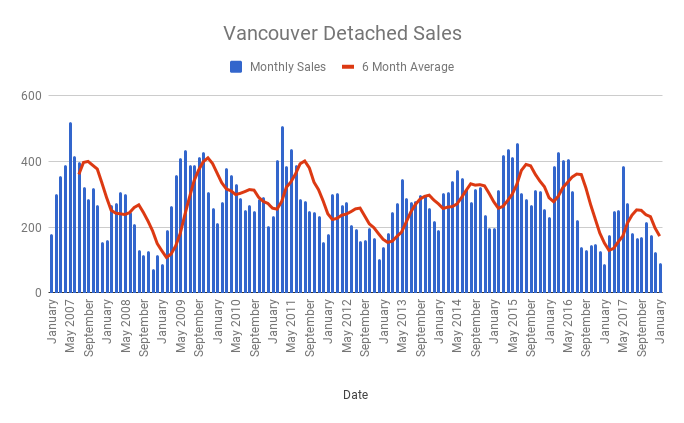 The sales to actives ratio for Vancouver detached homes was unchanged year over year at 7%. This suggests downwards pressure on prices and more favourable conditions for buyers than sellers. 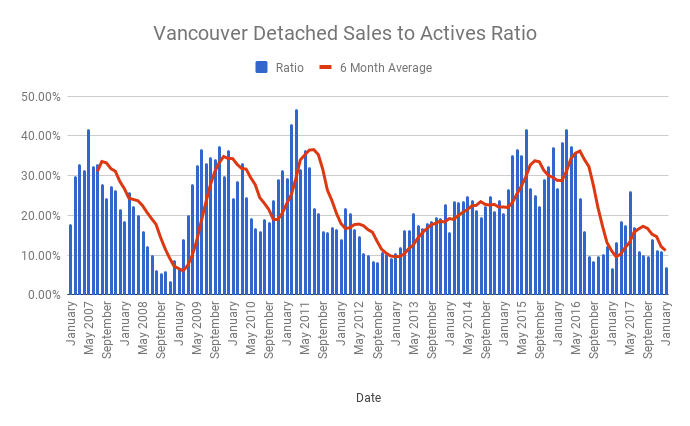 Sales to Actives ratio for Detached homes in Vancouver. While having access to the numbers and the data is nice, the interpretation of said data is critical. As always, focusing on the trends as opposed to the monthly fluctuations should be the priority. Entry level detached home prices remain relatively firm with most of the pressure on more expensive detached homes, most of them off their peak pricing by about 5-10%. The average sales price for January 2018 was $2,797,295. The median sales price was $2,273,000. The Vancouver detached market continues to be plagued by weak sales. This has allowed inventory to slowly build and put pressure on prices. With the added mortgage stress test and rising interest rates it seems difficult to expect a sudden rebound of buying activity. However, On a price per square foot basis, detached homes are now less expensive than condos. This is extremely rare in the history of Vancouver Real Estate. It begs the question how long this trend can last, or will it simply become the new norm? I’ll be closely monitoring the patience of sellers who have been relatively hesitant to reduce prices.